I have been sick the past few days leaving me with plenty of time to just sit and listen to some of my favorite music. Finally feeling a little bit better today I thought why not post a groovin’ High. Its been a while after all. How about some Coltrane. Growing up as a young tenor saxophonist I actually despised Coltrane. I never understood half of what he played, thought his avante garde stuff was absolute gibberish and hated his tone. I think my anger towards him also stemmed from that fact that there was this kid from North Jersey who was literally a Coltrane clone in sound and style. Mainly because he spent all of his practice time committing Trane transcriptions to memory. The little unoriginal copy cat mother fucker used to beat me out for first chair every year at All State Jazz band. It was always my outlandish solo’s that always blew the audience out of their seats though. Originality will always bring down a hack. As a youngster I preferred Sonny Rollins. I found he had such a bigger tone and brighter perspective. Coltrane always sounded so sad to me. Now years later I must say I am equally at awe with both men if not leaning a bit more on the Trane side. 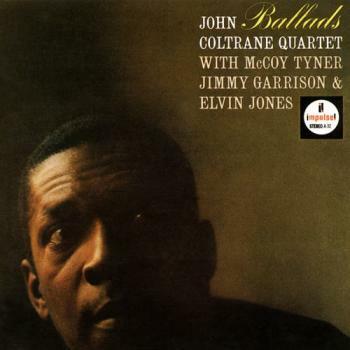 “Say It (Over and Over Again)” is from the John Coltrane Album “Ballads” released on the Impulse label, 1963. I initially came across it at a thrift shop in New Jersey back in 2004 on vinyl and at the time had an actual turn table to play it on. On instinct I was not expecting much never being a real fan of any of the ballads Coltrane played let alone an entire album. As soon as the needle hit the record and I heard that pop I was captivated by the magic that is John Coltrane. From that day forward I guess one could say I am a Trane fanatic. This tune is my absolute favorite from the album. Coltrane’s sound is just so sultry Add in the fine piano workings of McCoy Tyner and it is absolutely a charm to listen too. “Ballads” it one of my favorite by him and as a matter of fact I have that same vinyl LP I bought years ago hanging on my bedroom wall. Occasionally someone recognizes good music and it is refreshing. More times then not I get “Why is there a black man’s head on your wall”. Listen and enjoy a master piece.